Living in a post-10k-steps-per-day world. Hi! 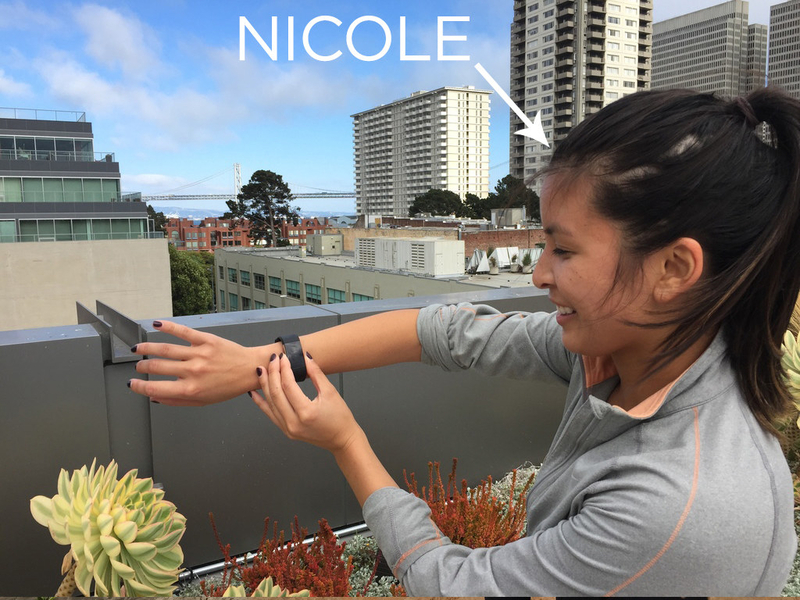 We’re Nicole, products editor, and Stephanie, health tech reporter. For the past month, we’ve been reviewing Fitbit's Charge 2, the successor to the best-selling Charge HR activity tracker. On the Charge 2, exercise and relaxation aren’t tracked as special, one-off events, but rather, they are as much a part of your routine as steps and sleep. If you’re ready to graduate from a 10,000-steps-per-day program, the Charge 2 might be a good tracker for you. In addition to continuous heart-rate tracking, Fitbit’s new wearable, which recently became available worldwide, offers a multi-sport mode (including yoga, spinning, and circuit training), guided breathing sessions, and a personalized “cardio fitness score” that reveals how fit you are (and could be). It also has interchangeable bands and a display that’s four times larger than last year’s Charge HR. Is the Charge 2 right for you? Read on! Let’s talk about the biggest improvement first: the bands. The Charge 2 has the same sleep, heart rate, and altitude sensors as previous Fitbits and, like the Charge HR, runs on a battery life of up to a week or so. The technology is largely unchanged – but the big game changer are the interchangeable bands. Take a quick look at Fitbit’s Facebook page and you’ll find dozens of commenters complaining about torn straps and warped bands. If the band was faulty, the entire Charge HR needed to be thrown out, even if the tracker itself was fine. The Charge 2’s bands, on the other hand, are replaceable. Fitbit’s offering a leather version for $70, along with a classic elastomer band in five different colors for $30. The Charge 2 looks sleeker, but is still pretty chunky. The device is essentially a Charge HR with a larger screen. The Charge 2 is a little bit wider and a little bit thicker than the previous model, but comfortable enough to wear all day (although too cumbersome enough to wear to sleep for Nicole). The classic Charge 2 style comes with a silver-accented tracker and the same rubber-y elastomer band as other Fitbits. For $30 more, you can also choose from two new “special edition” Charge 2 options: one with an all-black tracker and a “gunmetal band,” and another that has a rose gold tracker paired with a lavender band. It’s fancy. But it still looks like a fitness tracker. Working out with a big display makes a big difference. The Charge HR’s screen, which was about .75cm long, was truly the tiniest screen we had ever used. The Charge 2’s large display makes it easier to, you know, actually see information. When the “raise arm to wake display” feature worked (which was about 70% of the time), being able to look at our current pace, steps, and heart rate while running was particularly useful, so we could actually tell when we were slacking off. There are several clock faces you can choose from – and there’s finally room to show calendar notifications and text message previews, in addition to caller ID. But, like the Alta, text messages still get cut off, meaning you have to open your phone anyway. The Charge HR only had one generic “exercise mode.” The Charge 2 has a “multi-sport mode” with NINETEEN options. You can choose from treadmill, yoga, pilates, kickboxing, spinning, circuit training, and much more, right from the tracker. In the app on your phone, you can choose which seven exercise shortcuts appear on the Charge 2, and customize the order in which they appear. One cool new mode is “Interval Workout” for workouts with alternating periods of intensity and rest (like this). You can set the move and rest times on the app, plus how many times you want to repeat the interval. When the interval is up, the tracker will buzz and it’ll show “move” or “rest” on the screen. After years of fidgeting with different apps and the built-in timer on the iPhone, the interval workout mode, so far, has been our favorite use of the Fitbit. In the Fitbit app’s Exercise section, you strangely can’t filter workouts by type. You can see a chronological list of your workout history, but if, say, you wanted to look at only bike rides from the past month, you wouldn’t be able to do so. Also, you don’t get special sport-specific stats that, for example, auto-track how long you held chair pose when you select yoga mode (it will, however, track the duration and heart rate during your practice). But it does validate activities like yoga or hiking as legitimate exercise. Simply by acknowledging that those activities exist, Fitbit is providing a strong motivational tool for users who prefer alternatives to just running or biking. Other fitness trackers (like Garmin wearables and the Apple Watch) focus on runs, walks, and bike rides, and categorize everything else as “other.” Fitbit is more aware of the different ways people actually exercise (elliptical! tennis! boxing!) and give you the option to categorize your workout as such. This, IMO, is where Fitbit shines. The Charge 2 has a tap screen, not a touchscreen, which takes some getting used to. Tapping on the larger display is much easier than it was on Fitbit’s Alta, which we reviewed earlier this year. Still, the Charge’s interface isn’t very intuitive – initially, at least. The hardware design is very basic (just one button! ), which means that there are some trade-offs with ease of use. On the one hand, there’s only one button to figure out, but on the other hand, Fitbit needed to program in a lot of different button/tap combos to accommodate all of the Charge 2’s features. If you want to get serious about tracking your workout on the Charge 2, you’re going to need to learn all of them. To select a sport mode, you need to press the side button and then tap to view the different types of exercise. To start the workout, you press and hold the side button. To scroll through real-time stats, you need to tap or press the side button multiple times. When you’re done, press and hold the button again to finish. You get the idea. A lot of taps and button pressing. Putting the tracker into a specific exercise mode really only affects one thing: what shows up on the display while you’re working out. The screen will always show the duration, plus the information most relevant to that sport. For example, when run, bike, or hike is selected, and your phone is nearby, it’ll show the mileage in big, bold numbers at the top. If your phone isn’t on you, the Charge 2 will estimate that mileage, based on how long it thinks your stride is (you need to go on a run with your phone first for it to most accurately work). For weight training, it’ll show heart rate. Tapping the screen over and over again to see different stats during a workout is pretty frustrating. To avoid fiddling around with the display, we’d recommend just focusing on one metric: current pace for running and heart rate for pretty much everything else. 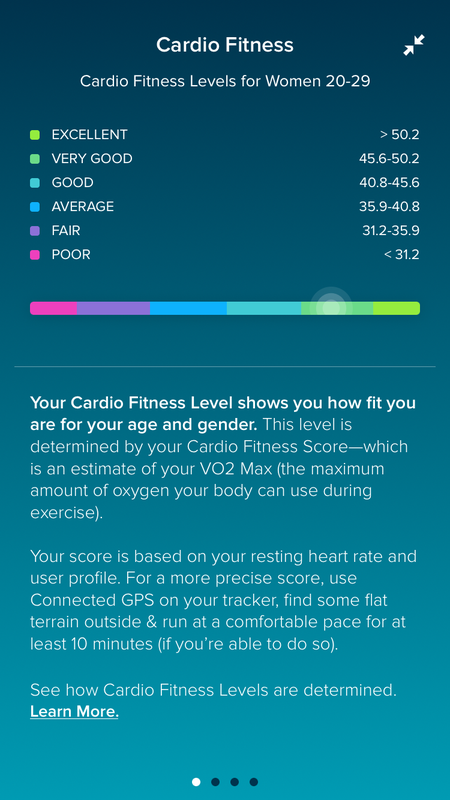 This score is Fitbit’s estimate of your VO2 max — the maximum amount of oxygen your body can use during exercise — and based on your profile (the weight, height, age and gender you input) and resting heart rate. 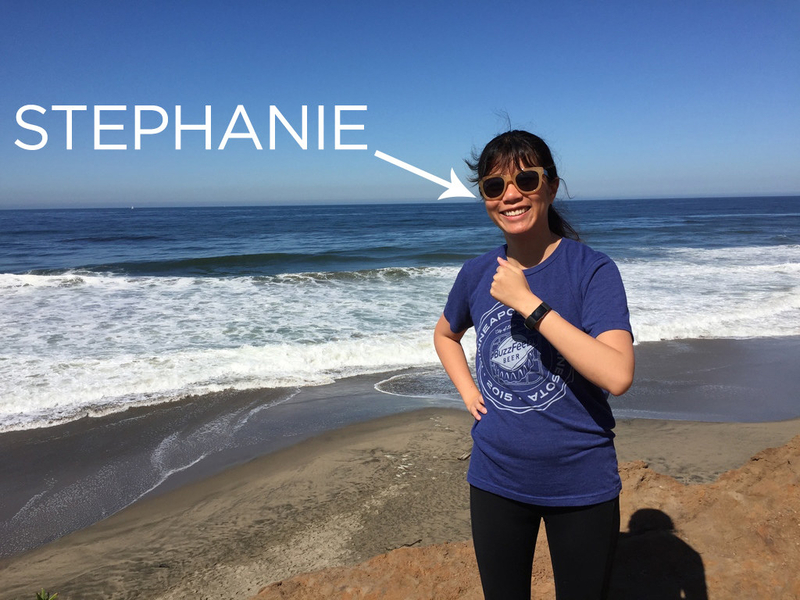 Fitbit told Stephanie she needed to step up the intensity of her exercise (one way would be making sure she’s working hard enough that her heart rate is elevated). She has not done so, but that’s probably just her fault. Keep in mind that this is just an estimate, and a more accurate reading, as measured in a sports performance lab, would include the amount of oxygen you breathe in and out. Stephanie’s score, for example, is between 45 and 49 (“good to very good” for women age 28; a professional runner’s is 63, according to the app). For most people, letting Fitbit’s automatic workout tracking (available for walk, run, bike, elliptical, “sports,” and aerobic workout) figure out what you’re doing is much easier than manually starting an exercise mode. You literally don’t need to do anything – the tracker knows when you’re working out and will log it in the app for you. In our experience, the tracker did a great job of recognizing runs, walks, and especially bike rides. The downside to auto-tracking? It doesn’t record GPS location data, so the mileage is less accurate, and if you want a map of your workout, you’ll need to initiate the exercise on the tracker. 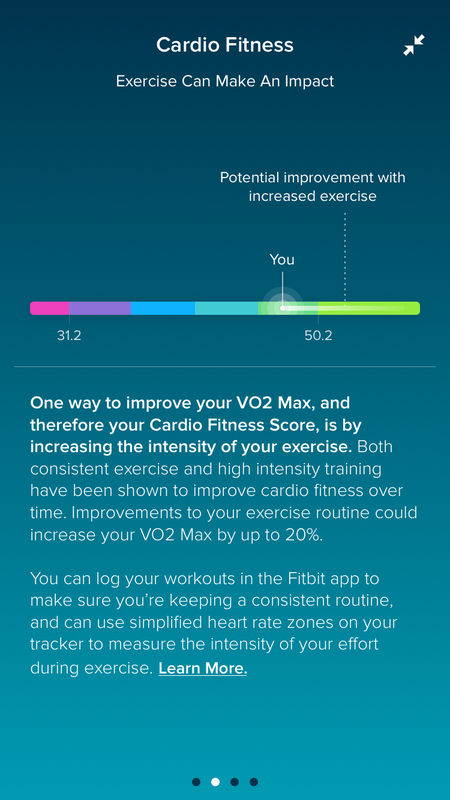 Here’s what Fitbit needs to improve. One of the most frustrating things about the Charge 2’s exercise mode is that you can’t pause a workout. The Strava app and Garmin trackers both have an auto-pause feature, and the Apple Watch can be paused by hitting its two buttons at the same time. There are plenty of reasons why you’d want to pause a run! Maybe there’s a cute dog you *really* need to pet, or an ex-coworker you need to gloat about your new job to. With the Charge 2, you have to either finish the workout and start a new one later, or let it run. The Charge 2 has a new feature called Connected GPS, which essentially relays information from your phone’s GPS to the tracker. It provides more precise pace and distance information on the Charge 2’s display and records a map of your run, walk, hike, or bike in the app. But, again, you’re tethered to your phone. The Fitbit app can record and map runs with GPS independently, so the trackers don’t actually add much value when it comes to this metric. Once you’ve used Connected GPS with your phone once to calculate your stride length, Fitbit claims you’ll get better estimates of your pace and mileage when you don’t bring your phone. So if you just go for a run with your tracker, you will get stats. But you won’t get a map or any other location data. And beyond that, because the Charge 2 relies on your phone, it may not capture location data with perfect accuracy. 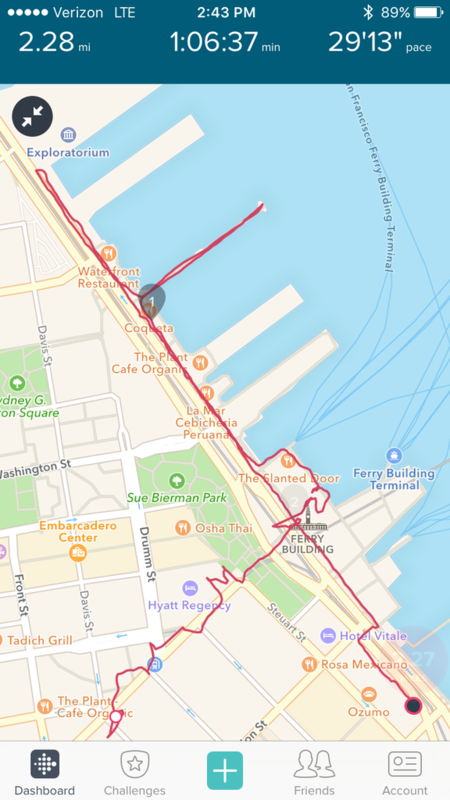 On Stephanie’s walk in downtown San Francisco with her phone, the tall, densely-packed buildings made the GPS tracker go haywire – and Fitbit’s app doesn’t work to fix obviously inaccurate data (Fitbit suggests turning off WiFi for best results). There are also multiple threads on Fitbit’s website citing issues with connected GPS. Fitbit integrates with Strava, RunKeeper, MapMyRun, Fitstar, and a dozen other activity apps – but it doesn’t sync activity with Google Fit or Apple’s Health app, where many users consolidate activity, sleep and nutrition data. Fitbit, which launched a sort-of smartwatch of its own, the Blaze, probably doesn’t want to share its data with companies it sees as competitors in the space. 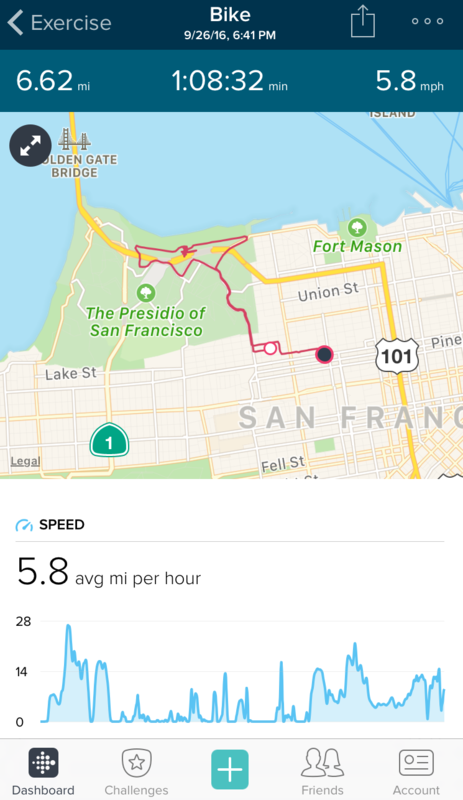 Nicole found a small workaround for this, at least to record workouts: connect Fitbit to Strava and Strava to Apple’s Health app or Google Fit. However, you won’t be able to sync your sleep or overall activity data. And it’s a really roundabout way to do something that should be straightforward. As we mentioned before, the device can detect when you raise your arm and turns on the screen when you do so. It’s called “Quick View,” and it works really well while running or walking – but for some reason the feature doesn’t agree with biking. It may be because your arm is already at a 90-degree angle while you’re holding the handlebars, and it’s not enough movement for the Charge 2 to tell when you’re raising your arm. The new “Relax” feature consists of 2- and 5-minute guided sessions that use an animated visualization to prompt you to breathe and slow down your heart rate. (App-guided meditation is very in these days.) To be honest, it was a little weird to try to be mindful with our eyes wide open and glued to our wrists; we would have preferred some kind of buzz or other physical feedback that let us closes our eyes. Okay, so who should buy the Charge 2? If you’re just starting a workout routine or ready to ditch a pedometer for something a little more advanced, the Charge 2 has most of the fitness-friendly features you’re looking for. Its heart rate and multi-sport modes will give you tools to improve your overall fitness. The Charge 2 is definitely geared more towards runners and cyclists – but if you’re into yoga, circuit training, or interval training, there’s something for you, too. The automatic workout tracking feature means that you don’t have to worry about logging a run with the tracker or app every time. And when you want more precise distance statistics, you can bring your phone and see mileage and pace on your wrist. On the mobile app, you can look at your cardio fitness score to see how you stack up against your peers, and read about what you can do to be fitter, whether it’s lose weight or increase the intensity of your workouts. The app is easy to use, and because Fitbit is the top-selling wearable company, according to an IDC survey, it has a big community. In the first quarter of 2016 alone, the company sold 4.8 million units. It’s likely that you have at least a few friends with Fitbits who can cheer you on. Fitbit also made a crucial update to the bands, making them removable and replaceable. There are more styles to choose from, and it’ll likely last longer than a Charge HR. If you’re looking for a heart rate-tracking wearable that’s not *too* expensive, tracks activity, and has basic smartphone notifications, then you should consider the Charge 2, which starts at $150. Who shouldn’t buy the Charge 2? Because of its thick, chunky style, we wouldn’t recommend the Charge 2 for those interested in sleep tracking. The Flex 2 or Alta are much better picks for that. Those two bands are also much more stylish and geared toward the fashion-forward set. If you want something that isn’t dependent on your smartphone, this Fitbit is not the right device for you. The Fitbit app is great, but the problem is, you need it to change a lot of different settings on the Charge 2. The connected GPS feature also relies on your phone for location data.The Charge 2 is sweat, rain, and splash-proof, but it’s not safe for the pool or beach. Fitbit’s Flex 2, on the other hand, is suitable for swimming. More serious athletes should consider swim-friendly, heart rate-tracking, and GPS-enabled wearables, such as the Vivosmart HR+ by Garmin ($200), Apple Watch Series 2 ($369), and Polar M400 ($180). And a final thing to consider: If you’re trying to lose weight or get fit, you may not even need a fitness tracker! A device like the Charge 2 can provide little bits of encouragement throughout your day, which may be effective for some people. But it’s more important to do research on how to exercise or eat in ways that support your goals to actually improve your overall, long-term fitness.